Hello Space friends, and welcome back to the mythical space known as Thera. In my original piece “What to expect when you’re expecting” I gave a brief outline of where I saw Thera in the future. This perceived pessimism was thoroughly excoriated in the comments. The big one was that all the scanning was good for EVE and good for players, it would return them to the way probing used to be, and make everything less instant gratification. Even CCP’s Devblog seemed to laugh at my negative attitude towards Thera. Thera will attract a mix of crowds as diverse as pvp corporations searching for some variety in their combat, industrialists serving the local market, explorers intent on puzzling out the secrets of the system’s history, adventurers looking to make a quick buck under their hunter’s noses, and dedicated local pvpers preying on all the rest and using the system’s unique geography to their advantage. We expect that Thera will appeal most strongly to players who find the concept of living at the center of an ever-shifting set of wormhole connections appealing. Residents of Thera will know that each day they will have a different menu of neighbors and access to different areas of known space. If you’re thinking this article is prepping for a big “I told you so,” you won’t be disappointed. So let’s run the numbers shall we? Let’s talk about what has happened in the last three months (December 10th to March 2nd). We’ll take a look at the kill stats, the state of the market, and the general living in Thera. Finally, we’ll look at how Thera could be fixed to make it better. One of the biggest problems with measuring the success of Thera is that CCP has pretty much made any easy fact-finding impossible. When wormholes first appeared, there was a conscientious decision to remove all jump statistic data from wormholes. In similar fashion, and after a lengthy debate, the same was done for the kill statistics in June of last year. There are a few limitations on my review, and I’ll just state them now. Thera is part of this wormhole system, so it is impossible to know how many players actually travel through the system and survive. I do have it on good authority, that Verge of Collapse, Bomber’s Bar, Furtherence and Signal Cartel all make their home in Thera. However, for the vast majority of these groups, playing in Thera isn’t really their goal. They simply use it as a quick way to get around EVE through the provided wormholes. With all of this lack of information, it means we need to reconstruct it in the most useful ways we have available, namely, killboards and market activity. 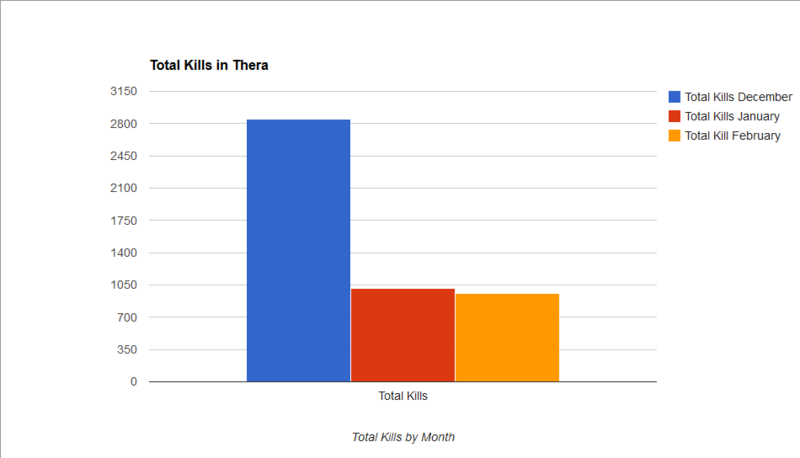 As we can see from the report pulled from Zkillboard, Thera’s first month it was on tranquility boasted 2,853 kills. For a brand new system, and a wormhole system that required a bit of effort to find, nearly 3,000 kills in a month isn’t terrible at all. People wanted to visit it, and people wanted to be active and fight in the newly discovered wormhole. In my interview with Longdrinks, most of the kills were found at the undocks, where ships and pods fell prey to the dictor bubbles. However, as time went on, activity in Thera also subsided. Both January and February were fairly close in the total number of kills, with 1013 kills in December and 957 kills in February. There is also a variable meta forming in Thera. While bombers and interdictors were the favorite ships in the beginning, the meta has quickly started to adopt interceptors and the new Confessor and Svipul T3 destroyers. Compared to some of the other “pirate” systems, like Tama, which had 6111 kills in February, or the ancestral home of the Waffles, Kinakka, which boasted 1604 kills, Thera is not that active. CCP believed that the “ever-shifting set of wormholes” would be a boon, but as it turns out, it doesn’t actually benefit it any more, than the smaller, and much more static K-space systems. Now at this point people will say that killboard stats aren’t everything. And they’re right. It’s only one metric of success in determining how “active” a system is. Market activity is another fairly good indicator. Industrial health and market activity are pretty good indicators to determine if a system is being lived in. As someone who has lived in the horrible places of Wicked Creek, I can attest to the importance of a strong market. While the prevalence of jump freighters and easy access to Jita are good, there really isn’t a substitute to having things directly on hand. This goes the same for wormholes. Unfortunately, one of the unintended consequences that came with the industry changes in the Crius expansion was that it is impossible to see what job slots are being utilized. The subsequent removal of the work teams, which admittedly was needed, makes it even more difficult to know where business is booming. There are also no anchorable POSes that could house manufacturing bays. As a result, the only real way to know if something is happening in Thera is by looking at market activity. With only four stations, and connections to everywhere, it would be conceivable to believe that people would ship in materials needed for other travellers and also maintain a small stockpile of supplies. It’s also conceivable that there are thousands of locals all quietly hiding in their station of choice, and hoarding their supplies. The markets in Thera can be quite deceiving at first look. There is pretty much one of everything being sold. However, no one is really buying. One website boasts that the Thera market is quite profitable and It’s also the only blog I could find providing updates on Thera. 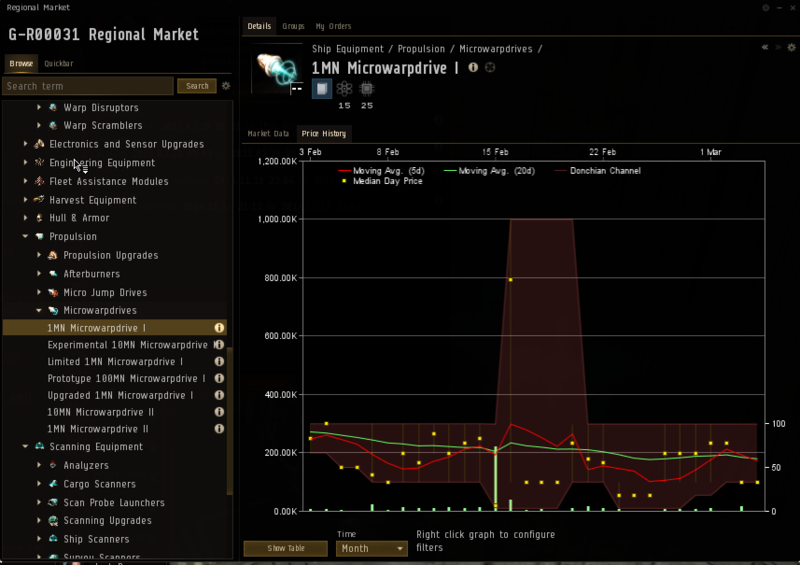 Over at EVE Lost and Found, Sven talks about the killer profits he’s made off of the market in Thera. And to be fair, selling something for a sevenfold return is really good. However, it took him over a month to sell the ten small Polycarbon Engine Housing IIs. A month to sell ten items isn’t a good sign of high market demand. However, it is a T2 rig, so maybe it’s not a good indicator. Let’s take a look at at the 1MN MWD, in the T1 and T2 variants. 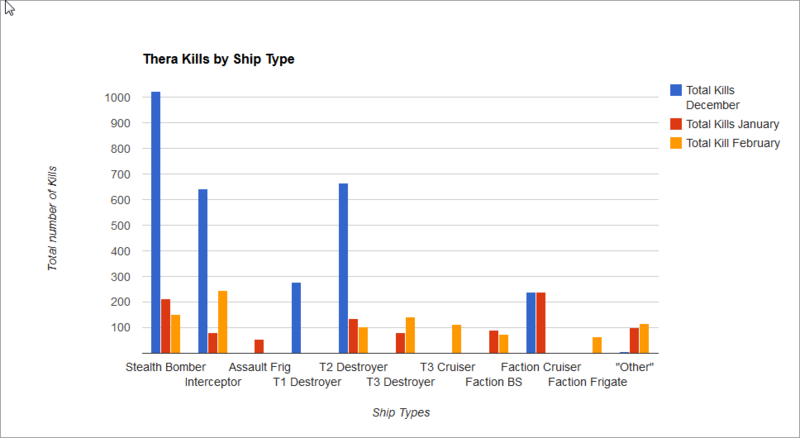 As we know from the PvP review, the most common ships in Thera have been, and continue to be frigate sized, so these should be good indicators of PvP activity. Pilots, eager to get back out into the fight, would likely be purchasing these modules in an effort to re-engage. With 1MN MWD there aren’t really a lot of purchases. The 1MN MWD, Limited 1MN MWD and T2 1MN MWD are typically the most widely used for fitting. However, there are more orders putting things onto the market than actually purchasing them. As you can see in the image, the price has sharply dropped, and the volume of sales, the green bar along the bottom, is well below what you’d see in an active market hub, even a small local market hub. Thera is also home to the Signal Cartel, a mostly non-PvP exploration corp. So for giggles, let’s take a look at the scanning and hacking equipment that their ships would surely use. There are a large number of Relic Analysers for sale, but a look at the purchasing history of the item reveals that it’s as popular as the 1MN MWD, that is to say, the occasional purchase occurs, but nothing major is happening on the markets. It’s impossible to say why the markets in Thera are stagnant. Perhaps it’s the fact that at any given hour Thera is 5 or less jumps away from a major market hub in K-space. The lack of PvP and the lack of a strong market are good indicators that life in and around Thera is pretty dull. Back in the day when I was a young and fearsome low sec pirate, the greatest corp in all of EVE, Tritanium Workers Union [WRKRS], were the scourge of low-sec Khanid space. If you’ve never heard of us, well… It’s probably because low sec Khanid space was, and is, one of the most desolate places in EVE. Of the 84 systems that make up the Khanid region, only 34 of them are low sec, and aside from Chamemi and a few other puddles for capitals to jump across, nothing was going on. I can say, with almost complete certainty, that Thera is the exact same way. So what happened? How did Thera go from being the killing fields it was in December to the back-water system it is now? Well firstly, one can measure the success of Thera by the amount of news and buzz that it generates. 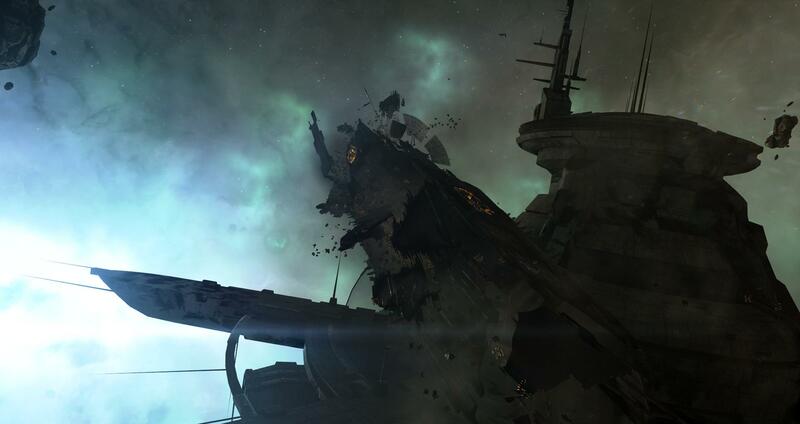 Jita and Tama are fairly infamous for both their PvP and their community. The same is true for many FW and null-bloc systems and generally any place lots of people congregate. Thera is dead because no one knows what to do with Thera. A Google search for Thera comes back with a lot of hits, but almost nothing after the initial release. It’s just not on anyone’s radar as a place to visit. The initial buzz that spawned the website EVE-Thera.com, which was billed as “Your source for quality Thera updates” hasn’t had an update since December 19th. The only other dedicated site, Eve-Scout, is still faithfully updating the website with connections. However, as stated before, it’s impossible to know if anyone is utilizing the data. Another killer to Thera was twofold. Firstly, despite all the impressive visuals that Thera offers, there really isn’t a lot to do. There are wormholes to explore, but of course that naturally takes people away from Thera. There are the data and relic sites, as well as the Sleeper sites that can be farmed, but the difficulty of the sites, as well as the great potential of being discovered by hostile pilots, makes them not worth the risk. Why stay in Thera and run sites, when smaller, more controlled systems do the same thing with fewer risks? The answer is that’s exactly what most people do. It’s better to be out of Thera for PvE and ISK making than in Thera. The second part of the killer is that the only safe place is the four stations. These stations hang in Thera like a bug-zapper on a porch. They’re extremely attractive for travellers, but also extremely dangerous. The original intention of the stations was to allow pilots a place to live, without needed POSes in system. What occurred, however, is station camping and stifling of any real growth. Thera overly rewards station campers by providing them a known source of kills. An alt docked can instantly call out when someone undocks, as well as tell if there is or isn’t someone docked in station. This is markedly different from gate camping, or wormhole camping, where it’s impossible to know if or when someone will come wandering along. It’s also much more difficult to get rid of. As soon as a mass undock occurs, the session change allows the campers to run. Compare this to camping a wormhole, where it would be possible to swing around behind the campers without them knowing. Ultimately, the station camping is a nuisance that only drives people away from living in Thera. Finally, like with all wormhole space, it’s very difficult to know if anything is occurring in Thera. In K-space, people can see when a fight occurs. In many instances, especially with long protracted battles, combat-tourists and “honourable third parties” come streaming into the fray. 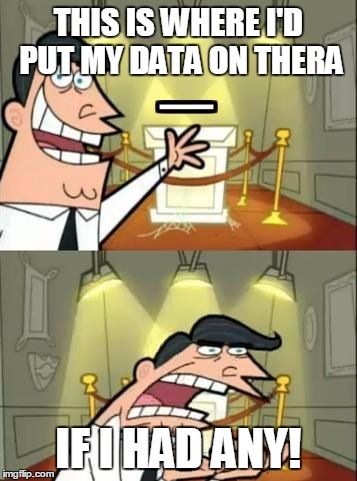 With Thera, it’s impossible to know if anything has ever occurred in the system. With no structure timers there isn’t an easy way to know if anything is “planned” for the future. The immense size of Thera makes it impossible to even know, immediately, if there is someone else in system. If EVE is supposed to be a social game, Thera is the antithesis of this, by ensuring everyone feels isolated. As someone who roams lowsec, and occasionally null-sec, if I can’t find a ship in the first minute, I’m off to the next system. There really isn’t any point in trying to track down the possibility of a hostile, when I know I can go somewhere else and find an actual spaceship to do violence upon. Thera needs to change. It needs to become more accessible and appear more lively if it is going to fulfill the expectations that CCP had set out for it. There need to be things for players to do that they can’t do anywhere else. Currently there are no conflict drivers that keep players in Thera, and that’s a shame. I am truly amazed at how pretty it is, but at the moment it seems like a still-life painting. Thera has a lot of potential, locked away somewhere.